Out door garden is a planned space aside for display, cultivation or to enjoy the natural environment. People usually love to walk in a garden of plants for fresh air and to rejoice the beauty of nature. So, here are some ideas or designs for the nature lovers to make a outdoor garden at your home rather than going out for a park or a garden. The gardening can be done by you by planting the shrubs or plants in the outer space.here you have a layout how to garden your free space at home.After seeing these pictures you feel interested and plan a garden at your home.Now a days the gardening is done creatively with a variety of designs and here you can see the images of out door garden of minimalist style which looks fabulous. In the view of this image you can see a beautiful layout of gardening minimalist style. The garden is planted with agave caribbean, agave angustifolia and osakazuki plants. The outdoor gardening gives a impressive look when you look at a house.You really feel that it is a peaceful environment. The plants are very useful for people. Generally we use ornamental plants or some people grow plants which are for preparing food. Here in this image the layout of garden is designed with the ornamental plants which looks grassy and is delightful. Here there is a different plant called osakazuki which gives a different colored leaves in the autumn season and is a deciduous shrub. In the view of this image the gardening is with variety of flowering plants and looks massive. Here the plants are wild plants,sun plants,ornamental shrubs and the outdoor garden is filled with turf. There is a chaise so that you can enjoy the nature by sitting in the lawn. In this image you can even observe a room with couches and the interior is decorated with the wood and is a place to refresh your mind and can feel pleasant. The outdoor garden is modern and unique. Make a garden in your outdoor spaces even in a small place so that you can revive. This image of outdoor garden is a minimal style with a different colored flowering plants. The plants in the image are perennial and wild plants. Here there are some large trees which gives shade to the houses and looks windy.There are purple,yellow and white flowering plants and has grass throughout the garden and is fenced with the bricks. The plants you want to grow can be seasonal and can even cultivate vegetables or fruit bearing plants which will be useful to you. The outdoor garden should be maintained neatly and one should look after it. In the view of this image you can see different flowering and nonflowering plants which is decorated as outdoor garden of minimal style.It looks beautiful with the plants such as ornamental plants. There is a fountain, architecture of which pours water into basin with a dramatic effect. Here you can place couches where you can enjoy the blissful and charming environment. Here fencing is laid along the garden to protect plants. The garden has many convolvulus cneorum which are flowering plants and are commonly called as silverbush. In the view of this image we find bushes,flowering plants and a fencing which surrounds the garden and this a outdoor garden of minimalist style. There are chairs with a centre table so that you can spend time and can have food in the natural environment. There are flowering and nonflowering plants such as convolvulus cneorum, rose mary,herbs such as lemon grass. In the image the garden has a fountain where it has a basin with water and is used for decoration effect. The garden has even lights and can spend in the evenings and relish yourself. This image is an layout of outdoor garden in minimalist style and is elegant.The outdoor garden is totally grassy with the ornamental plants around the grass.There are chaises to get relaxed and can have fresh air. The garden has coniferous plants such as spruce and fir. The garden looks modern and the house has glassy windows where they have a outlook of the garden from those windows. The garden is well designed and you can make this type of garden in your outer space. In the view of this image the outdoor garden layout can be seen.It is beautiful and is plain and grassy. You can even place couches or chaises in the garden as it has a large space and can reside. The plants veiled here are cress,ornamental plants, Plumeria Alba tree. The living room has a double hung windows where you can get fresh air from the garden. You have to maintain a garden in the space you have either it is small or big so that you can spend time with your children or family. 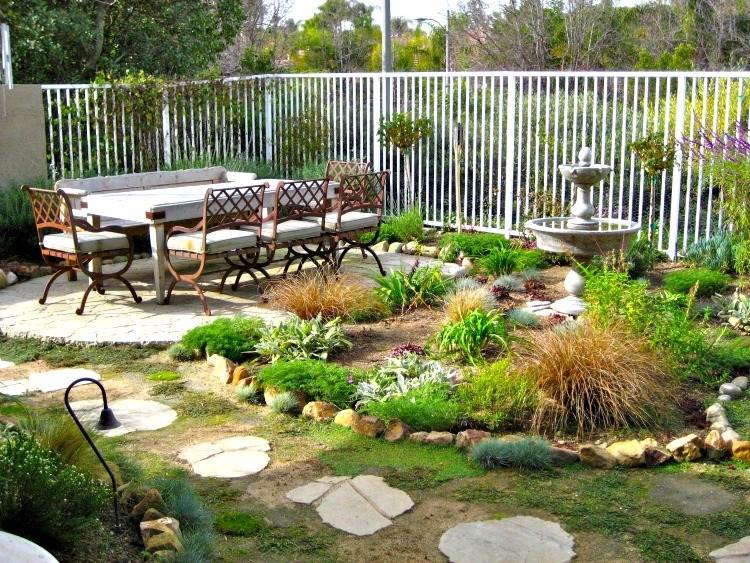 The above garden is perfect outdoor garden if you have a large space in your home. This image has a view of outdoor garden is amazing. The garden has lots of grass and ornamental plants. It has ,rose mary,weed plants and few flowering plants.There is a seating arrangement made with the couches with pillows and can enjoy beauty of nature and it looks phenomenal. 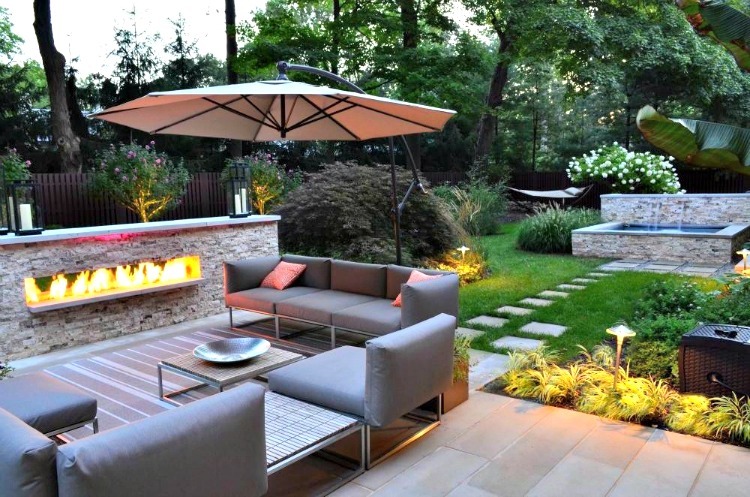 If you are a nature lover, you definitely like this outdoor garden and remodel your garden. When you look at this garden you will feel cheerful and it also give shade to the house. As there is much empty space in the garden you can even place a chaise and have a restful nap by enjoying the fresh and natural atmosphere. .The garden layout is minimalist style and has large space. The garden looks loyal and refreshes your mind.It has has a stair case and we can even place settee in the low lying part of the garden as it gives shade when it is a sunny day. 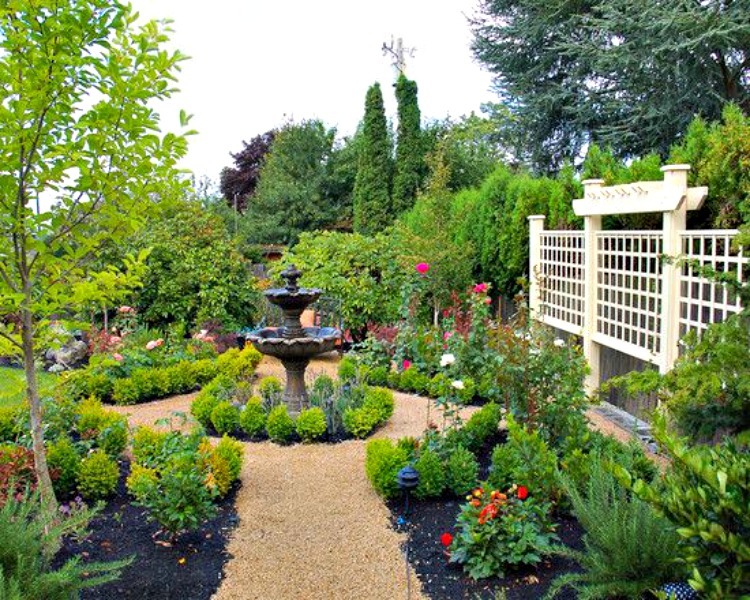 This image of outdoor garden is simple and stylish.The outdoor garden is decorated with some ornamental plants. It has a way with the marble to walk and has fencing to the outdoor garden. There are sofas in the outdoor garden which looks elegant. The garden has topiary. This garden suits if you have a narrow space in the garden and you can even place flowering plants as your choice.The outdoor garden allure your house and always creates a welcoming environment and make you feel pleasant.